DURHAM, N.H. - The Univeristy of New Hampshire women's ice hockey team defeated the Holy Cross Crusaders on Saturday afternoon at the Whittemore Center by a score of 9-1. Three wildcats tallied two goals in the contest, with several more getting multiple points on the afternoon. It was the most goals scored by the Wildcats since the 2007-08 season, when the Wildcats defeated the Maine Black Bears on February 2, 2008 in Orono, Maine by a final score of 9-1. Freshman goaltender Ava Boutilier (Charlottetown, Prince Edward Island) got the start in net for the Wildcats and imrpoved to 2-0-1 on the season stopping 21 of 22 shots faced. - The Wildcats scored three goals in each period. - Three minutes into the first period, Devan Taylor (North Billerica, Mass.) got the scoring going on a power play. She scored on a rebounded save on a shot by Kate Haslett (Rothesay, New Brunswick). - About one minute later, UNH's second goal was scored by Nicole Dunbar (Coto de Caza, Calif.) on a snipe from the left faceoff dot, once again assisted by Haslett. - Just 31 seconds later, on another Wildcat power play, Julia Fedeski (Algonquin Highlands, Ontario) fed the puck into traffic and it bounced off a Holy Cross defender and into the net to give UNH a 3-0 lead. - Holy Cross answered back nine minutes into the period on a rebound off of Boutilier, scored by Amanda Kewer, who was fed off the rebound by Victoria Young. - The second started off almost four minutes into the period with Taylor scoring her second of the game, with a perfect shot just underneath the crossbar. The assist was to Ali Praus (Long Lake, Mich.). 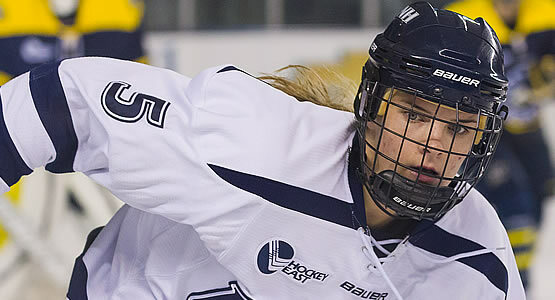 - Fedeski tallied her second power play goal halfway through the period as a shot by Tori Howran (Bancroft, Ontario) deflected off the Crusader net-minder and found Fedeski's stick for UNH's fifth goal. - Just over a minute later, Meghara McManus (Milton, Mass.) got a rebound from behind the net and put a shot on net as she fell to the ice. The Holy Cross goaltender couldn't make it back in time, and it was in for UNH's sixth goal. The initial shot was taken by Grace Middleton (Midland, Mich.) and bounced off the goalie's pads and off the boards behind the net. - In the third period, Haslett tallied her third point of the afternoon seven minutes into the period. She took a long shot from just past the blue line, and it found its way through the goalie's pads. - Dunbar scored her second of the game nearly 12 minutes into the period as her shot from the right faceoff circle bounced off the goaltender, into the air, and landed behind her for a goal. - The final UNH goal was notched by Hworan, the first of her career, 15 minutes into the final period. She took a shot from just beyond the blue line straight on, and it deflected off a defenders stick into the top corner of the net, for the final 9-1 score. UNH: 3-6. Holy Cross: 5-10. UNH: 2-5. Holy Cross: 0-3. Assists (2): Four players tied.